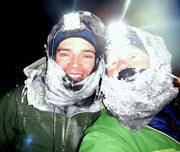 Last weekend, after another hard rally up a mountain in Utah, I returned to find a text from Beat: "Yo, I'm signing us up for the 50K next weekend. That's what you get for not picking up your phone." It's true that I'd expressed regret about skipping out on the Diablo 50K, and maybe I would enjoy going out for a long run in the near future. But in the very next breath, I reiterated our need to put in some more cycling miles ahead of Frog Hollow, and reminded Beat that my actual running mileage (as in, not hiking or scrambling or crawling) has been low since I injured my knee during the San Lorenzo 50K in June. My Iceland and European experiences were a different beast entirely, but running has remained on the backburner ever since. I've averaged one run a week, in the six- to eight-mile range. Not one of these runs has gone well. I felt sluggish on the climbs and tentative on the descents, got side-stitches and ITB tightness, became frustrated about my pace. "I'm super slow right now," I warned Beat. Meanwhile, my cycling efforts have been on an upswing — I'm feeling stronger, climbing faster, descending with more fluidity and confidence. Hiking is still great as well. But for whatever reason, I open up my stride into a run and everything starts to fall apart. While most of my athletic abilities were hard-won over years, running especially seems to just not come naturally. "Running is really hard for me," I've told friends. "I think that's why I want it so much." So even though cycling has been going really well, and just one good, half-day mountain bike ride would probably work wonders to improve my confidence for the 25 Hours of Frog Hollow, I showed up at the start line for the Coyote Ridge 50K on Saturday. Looping through the recently opened Golden Gate National Recreation Area in the Marin Headlands, the Coyote Ridge 50K is a deceptively difficult course. It looks tough on paper, too, with an advertised 7,300 feet of climbing (I Strava'd closer to 6,100 feet of climbing, but it's still a healthy dose of ups.) But what makes this course tougher than most I've run is the fact that much of the climbing and descending happens on very steep fireroads and trails, with flattish sections in between. Less variation in grades usually translates to a consistent pace, while transitioning from steeps to flats always throws me off kilter. On this day, I was comfortable marching fast up the climbs that nearly everyone hiked (after PTL, I've developed a new mantra — If you're not using your hands, it's not steep.) Same with the descents — it's the dry chunder time of year and trails were loose and slippery, but take short, quick steps and it's fine. But the flatter, runnable grades? Argh! My IT band locked up early and knee pain thwarted attempts to open up my stride. It was a gorgeous day, with flawless blue sky, coastal cliffs sparkling in the sunshine, and low fog wafting in from the Pacific. I was thrilled to be out there, and wanted to do this awesome day justice by putting in the best running effort I could. The IT band was grumpy but I found I could break up the tension by rubbing the side of my leg as I walked. This relief didn't last long, but was often enough to earn me several minutes of pure running bliss, prancing along the edge of a cliff high above the shrouded ocean waves in a place that seemed miles away from any notion of pain or fatigue. The leg was back in lock-up phase as I shuffled into the finish at 6:43, which I found disappointing. I'd run the first 15.5 miles in three hours flat and thought I could even-split this race given how solid my endurance feels right now. But, no, running wouldn't let me, because running is hard. The time doesn't matter, but in racing — even spontaneous "for fun" races — most of us trick ourselves into believing time is important. We do so because this belief motivates us to try our best, which enhances the experience. This is what I love about racing. But sometimes I finish and I'm disappointed. Several of my races this year have been like that. This race was like that. Beat and I had set a "cut-off" time of seven hours, as our friend Martina's birthday party was that evening, and we were helping with the hosting at our apartment clubhouse. We had to leave Muir Woods by 3 p.m. so we would be home in time to start setting up. Beat was trying to usher me out of there, but I demanded a snack because I was feeling ravenous. 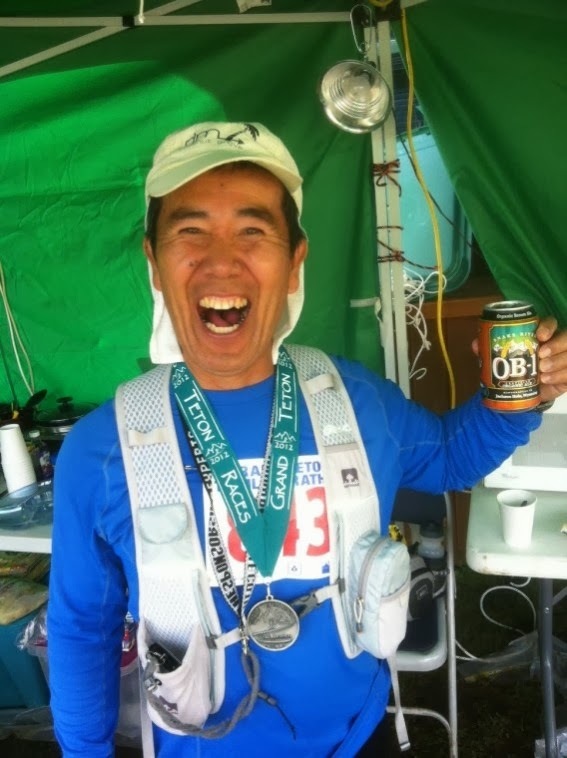 As I was standing at the table gnawing on a chicken leg, a Japanese man who was participating in the marathon distance ran into the aid station. I thought he was finishing the race, but as it turned out he had only completed the first loop and still had seven miles to go. The race director, Wendell, informed him that the cut-off had passed and the sweeper had already been sent out. But he could continue if he wanted to, knowing that the trail markers might already be taken down. "Will you still be here when I get back? Will all of this be here?" the Japanese man asked as he gestured at the food on the table. "I will be here," Wendell said. "I'll even make you a burger when you get back." "I will do it," the man said. "I will run for hamburger." "I ran with that guy for a bit," Beat told me. "He directs a race in Japan, called the Eco Slow Marathon. People carry bags to pick up trash along the way, and they're given as long as they want to finish. He has this philosophy of slow running." Hahime Nishi. Photo from Dreamcatchers. This trash-collecting race was intriguing, so I looked him up. 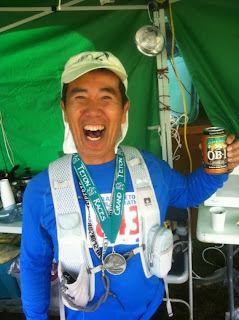 As it turns out Hajime Nishi is an extremely dedicated and enthusiastic marathoner. He's chasing a life goal of running 1,000 marathons in 250 countries, and he's already up to something in the mid-600s at age 64. He held (and possibly still holds) an official world record for running seven marathons on seven continents in seven months. He started running after his wife died of cancer in 1990. He touts enjoyment, connection, and savoring experience above all else. He takes a lot of photos and stops to absorb the scenery whenever the urge hits him. But he loves the challenges and constructs of a marathon. A marathon, he says, is about learning more about people, cultures, and himself. According to a Runner's World article, his "worst marathon time" is 3:45 and his "best" is 10:32. Of the Ecomarathon Inba, which disqualifies participants if they arrive by vehicle, gives prizes for those who pick up the most trash, allows only reusable water containers and locally produced food, and isn't timed, he said, "The idea is to lower the bar of the marathon — to make it more inclusive to society —and to increase the winnings of the environment. Before, I thought, 'Winner takes all. It's very important to win.' And now, I realize this is wrong. Everyone has value, not just the winner. Marathons should respect participants, the environment and local culture, and that is what I am trying to do." He wrote a book, published in Japanese, about his anti-competitive philosophy called "Losing is Winning." It seems Hajime goes to lengths to promote his worldview, which is an intriguing development for a man who admits that, until his wife died, he was committed to accumulating wealth and power, and quite successful in that regard. It's also interesting to consider in a time when the divide in running culture is widening. On one side of the gap you have what many view as "easy," ecologically dubious but hugely successful Color Runs, and on the other there are people who think everyone should be competitive in the same old ways with no consideration of the vast diversity of abilities, values, and passions among runners. I'm not saying I agree with or disagree with Hajime's message. The dichotomy between competitiveness and anti-competitiveness is something I struggle with myself. And it is problematic to promote eco-sensitivity and minimizing one's footprint while traveling all over the world to run races. But I wholly embrace Hajime's zeal for life and desire to share his passion with others. The world definitely needs more of that — zeal for life. And this is another reason I love running races — an opportunity to meet, even if only briefly, people like Hajime. Interesting character for sure. Me thinks ye got his best and worst times reversed. No biggee. Funny, now that my first ultra season is essentially over, I'm finding myself thinking about that very dichotomy you write about. I approached ultras like Hahime did (even my DNF) and had a great time. The only downside was stress of timing out. Now I want to get faster to find my limits and avoid the cutoff stress in 2014. I hope I can still enjoy the races while running at a more "uncomfortable" pace. "Amateur runners who race just for time need psychotherapy," says Nishi, whose "worst" marathon time is 3:45, and "best" is 10:32. "What is the purpose? Ecomarathon is beyond competition, but with connection." What a cool guy!!! I sort of like his philosophy. It's important to have those counter-points out there. Plus his attitude is so fun. Great post, Jill! I love being competitive, but I also like the meditative aspect of running (or skiing, biking, etc.). I can see a place for both in my life. I also did a double-take on his "best" and "worst" marathon times. Then I got it. Jill, just recently started following from Kenai. Great stuff (that would be even better if you took the time to think about and articulate what you reeeeally think about the relationship between intense outdoor activity and relationships with significant others who are themselves rather intense about their outdoor pursuits - lots of couples have to deal with this situation, after all) best wishes and thank you for sharing your adventures! Jill...got it when I thunk about his philosophy.